This is a book for the short-term trader of stock market indices. It covers all the Sun-Moon, Sun-Mercury, and Sun-Venus combinations and their correlation to 4% or greater reversals in the Dow Jones Industrial Averages, the NASDAQ Composite Index, and the Nikkei Japanese Stock Index. It organizes these frequencies into "highest" and "lowest" probabilities of correlating with an isolated low or high from which a 4% or greater reversal will unfold. These studies are based on the daily data of the DJIA over the past 60 years, and the past 16-18 years of daily data on the NASDAQ and Nikkei. From these studies, one can clearly see which 1-3 day time bands each month are most likely to coincide with a short-term trading reversal. The information is invaluable for those who prefer minimum exposure (like day-traders) in a position of high probability reversal zones, or for those who like to trade only selectively (a couple of times per month) but for fast and quick potential profits. 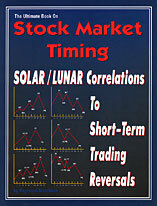 With this book, you will know ahead of time which days have the highest probability of a tradable reversal, and which have extremely low probabilities of a reversal, in these indices.